Welcome to the home page of Alpha Lodge, Ancient Free and Accepted Masons, located at 404 Concord Street in Framingham, Massachusetts. 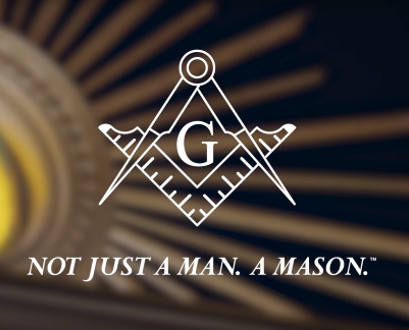 As a lodge of Freemasons, we are part of the oldest and largest fraternal organization in the world, an organization that is dedicated to the basic tenets of friendship, morality, and brotherly love. Alpha Lodge was formally constituted on November 13, 1876, and has been quietly serving the Framingham community since its inception. 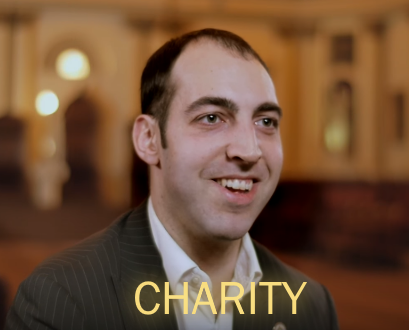 Part of our mission, and every Masonic lodge's mission, is to "make good men better" to serve our families, fraternity, faith, communities, and country. 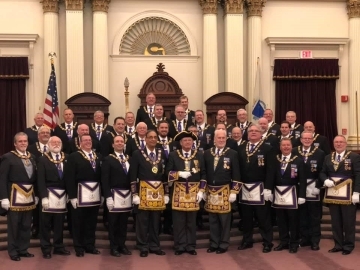 Alpha Lodge operates by charter under the Most Worshipful Grand Lodge of Ancient Free and Accepted Masons of Massachusetts. The first step to becoming a Freemason, especially if you don't know any, is to get to know some of us. 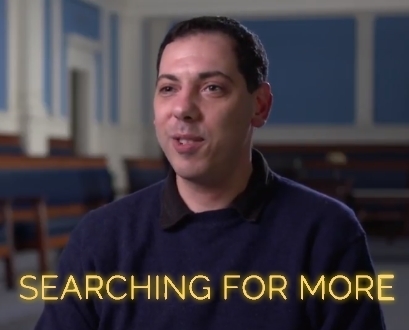 Becoming a Freemason is a very personal decision and is not a right fit for everyone. 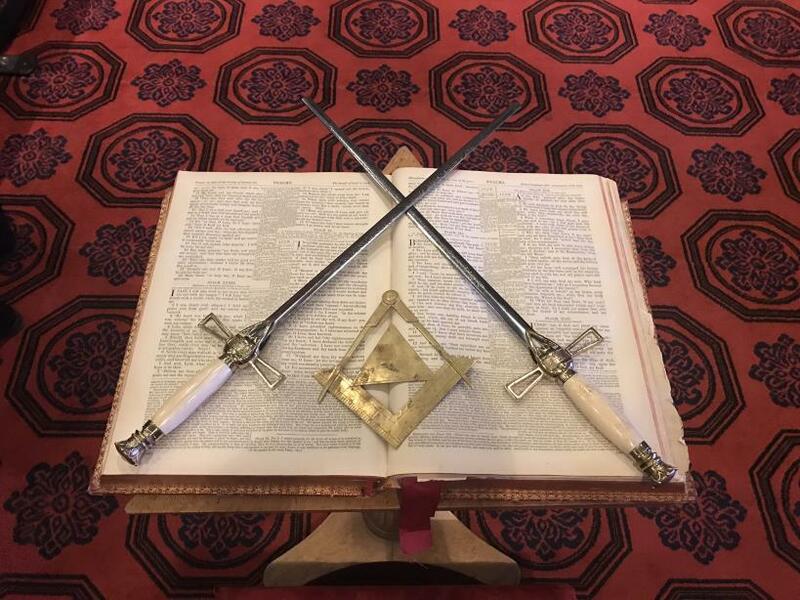 We want to get to know you to make sure Masonry is right for you, and you should get to know us to understand if we are the right lodge for you. We meet once each month and start by sitting down together to share a meal. We spend time catching up but will often have a presentation or discussion of an educational, historical, or philosphical nature. While meetings are reserved for only those who are Freemasons, guests and visitors are warmly received for dinner, by invitation. No one is asked to become a Freemason. This is not a society that has been privately selected by invitation only. 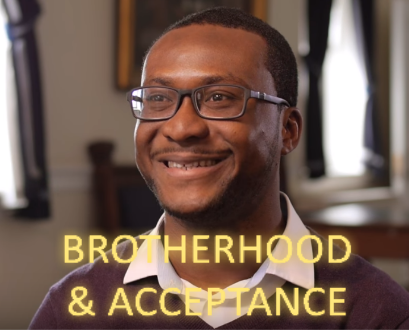 Our Fraternity is built on free-minded men who seek out and ask to be made a Mason. Once you have gotten to know some of the members, ask for a petition. They will let you know if they think it is right for you and the right time to join. Once you fill out your petition, you will be expected to give references to vouch for your character and values. This is one reason it is so important to get to know some of the members. After you have your petition submitted, several members will be assigned to your request and will meet with you to explore your interest and provide answer to any remaining questions. 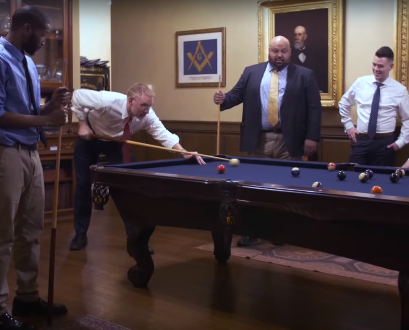 The members of Alpha Lodge escorted three candidates to the 2018 Fall 2019 reunion of the Ancient and Accepted Scottish Right, which boasted one of the largest classes in recent memory at 212 candidates (and more on a waiting list). Behind the scenes, Alpha brothers worked as members of the Knights of St. Andrew, with Craig Rothman, Rich Goetz, and Bill Gianoukos assisting. Al Grenier and Adam Marks worked as part of the degree team. If you have interest in joining the AASR or in working within one of the bodies, please contact Adam Marks, our AASR district champion. 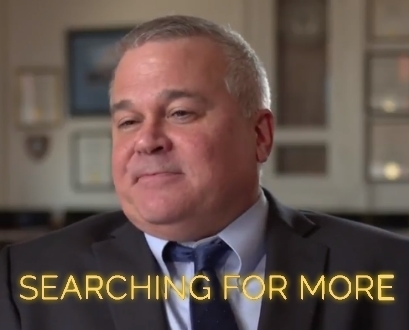 On October 12, 2018, a small, self-appointed delegation of education-minded Freemasons, Adam Marks, District Education Officer and Past Master of Alpha Lodge, Don Crookes, Past Master, and Brother Christopher Childress, newly-made Master Mason, made a Masonic pilgrimage to the George Washington National Masonic Memorial seeking further light. These education-centric Masons were not just hoping for a tour of the beautiful museum but, like all good Masons, they were looking for those hidden gems, intentionally positioned within and without the temple, and, if you ask them, they might just tell you they found them--then again, they might not. On November 20, 2018, at the last fraternal meeting of the District Deputy Grand Master, Right Worshipful Brother Alfredo J. R. Canhoto, a suite, too large to count, formed to say goodbye to our DDGM. Right Worshipful Brother Canhoto has been a true friend to Alpha and the other lodges in the district, and members of Alpha Lodge were on hand to give him a fitting send off. At the feast of St. John, December 26, 2018, at the Grand Lodge in Boston, Worshipful Brother Dan Vogel of United Brethren Lodge, and friend to Alpha Lodge, was named District Deputy Grand Master for the 15th North Masonic District. We wish Right Worshipful Brother Vogel the best of luck and offer him our full support. At the Alpha Lodge regular communication on Monday, November 26, we will be conferring the Third Degree on two worthy candidates. The third degree of Freemasonry is the final degree that a man experiences on his journey to being made a Master Mason. The journey, however, does not end with the third degree. 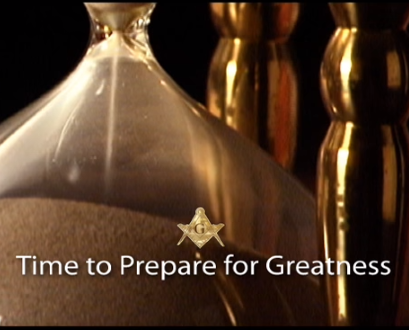 Freemasonry is a lifelong journey of learning and bettering oneself. 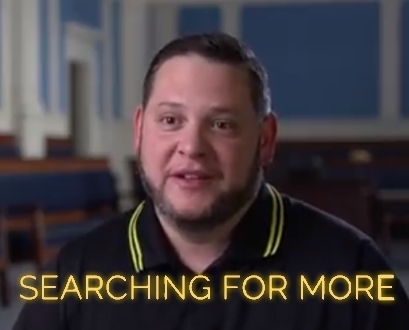 If you have interest in speaking with someone to learn more about Freemasonry or how you might become a Freemason, please click on the Learn More button. The Freemasons do not solicit membership, so you should feel free to inquire without committment. 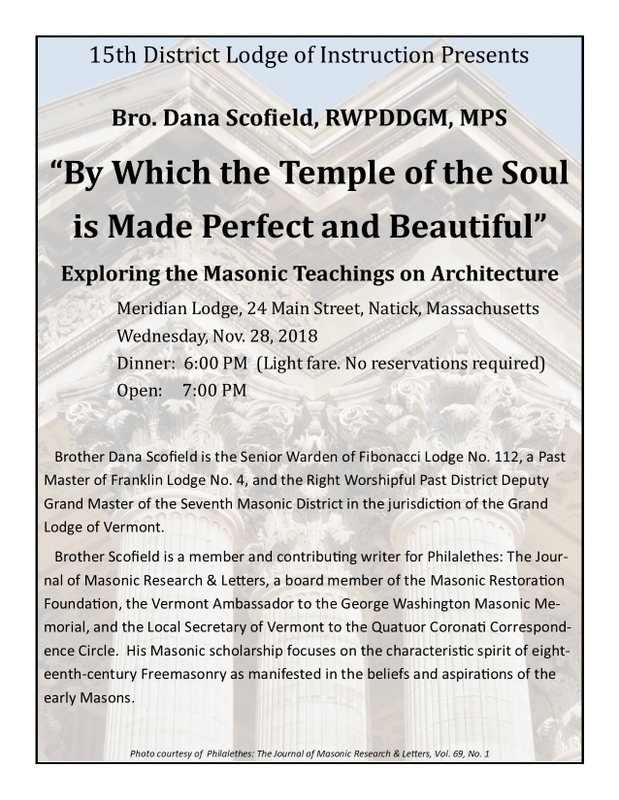 The 15th District Lodge of Instruction, hosted by Meridian Lodge this month, is honored to have Right Worshipful Dana Scofield presenting. 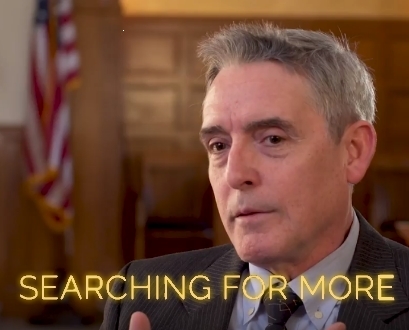 Brother Scofield is a friend of Alpha Lodge and has presented across North America for his scholarly work. 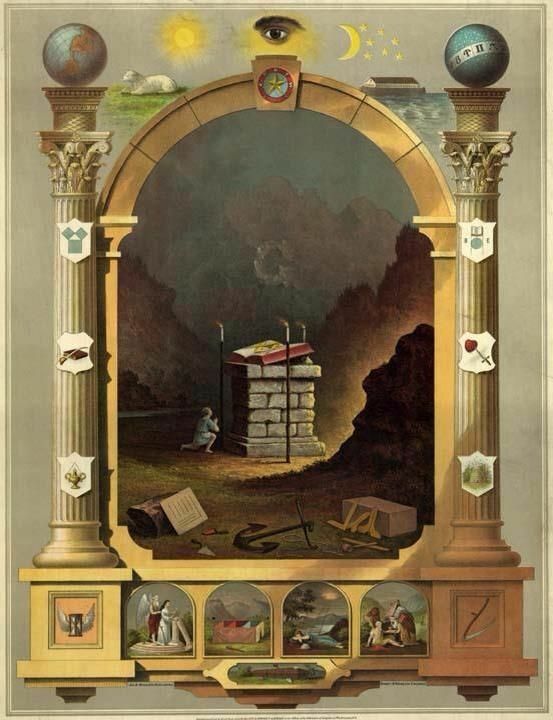 The presentation “'By Which the Temple of the Soul is Made Perfect and Beautiful': Exploring the Masonic Teachings on Architecture that makes up this presentation," was featured in Philalethes: The Journal of Masonic Research and Letters, Vol. 69. No.1. 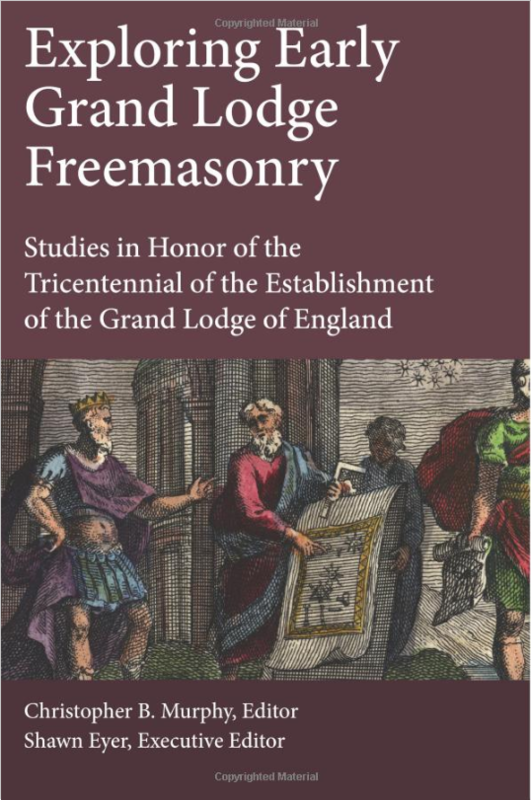 Apha Lodge and the members of the 15th Masonic District on November 24 at Meridian Lodge in NatickOther recent works by Brother Scofield include his work in "Exploring Early Grand Lodge Freemasonry: Studies in the Honor of the Tricentennial of the Establishment of the Grand Lodge of England." We hope you will join Alpha Lodge on November 28 at 6:00 PM for this important presentation. Brother Lee Dickson was a 65-year member of Alpha Lodge. After leaving leaving Framingham in 1953, he served in U.S. Army for 30 years (1953 - 1983). He served in Vietnam, and received the Distinguished Service Medal, Legion of Merit w/3 Oak Leaf Clusters, Bronze Star Medal. As an Army Colonel and veteran of the Korean and Vietnam wars, he was the head of army clubs and hotels worldwide. He frequently sent officers to participate in the week-long leadership conference organized by the School. 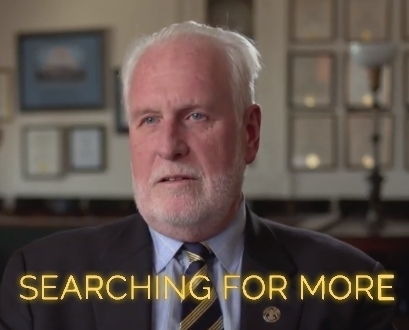 Highlights of his career include Operations Officer & J4 of MACV, Vietnam, Assistant Professor of Military Science (URI), Commander 95th S&S Battalion, Germany, G4 Delta Regional Assistance Command Vietnam, Army Director of Club Management. Co-Author "Riverine Operations" Army Training Text 31-75 ("67) and Military Review article (8/67) "Army Forces in Riverine Operations. Brother Dickson will be interred at Arlington National Cemetary on October 11, 2018. Freedom Military Lodge #1775 will be conducting the ceremony with the Master, Junior Warden, Chaplain, Junior Steward, and two members of Alpha Lodge in attendance. At the Alpha Lodge regular communication on Monday, October 22, we will be conferring the Second Degree on four worthy candidates. We will also be receiving the District Deputy Grand Master, Right Worshipful Brother Alfredo Canhoto, and his suite for his last official visit to Alpha Lodge.